It's officially grilling season, folks. While some folks grill year round (my brother and dad, to name two) I generally put the grill away once the leaves start to fall and pull it out again around Memorial Day. That long winter without grilled burgers, chicken legs and steaks makes them taste all the better the next summer. This year when I pulled out the grill, the first thing I tried were these Vermont burgers. I ran across the recipe this winter and waited patiently until the weather, my schedule, and a sale on ground beef coincided. It was worth the wait. If you are wondering what makes something a Vermont burger, imagine some of the best Vermont flavors all wrapped up in a hamburger bun. First of all, there is maple syrup in the burger. This may seem strange, but I promise you that it is good. You know how some barbecue sauces are somewhat sweet? This is like that, but with great maple flavor. Second, there are grilled apples on top. If you can find McIntosh this time of year, that would be a great choice, but otherwise choose a non-sweet apple with some flavor. (i.e. - no Fuji, Braeburn or Honeycrisp.) This gives great contrast to the maple syrup flavor. Then there is bacon, which isn't necessarily Vermont-y, but . . . it's bacon. Finally, the whole thing is topped with a thick slice of sharp cheddar cheese. The salty cheese, the sweet maple syrup, the bacon, the apple, it's all a happy combination that feels very gourmet and special. Like most things from Vermont. (Full disclosure - I grew up in Vermont.) 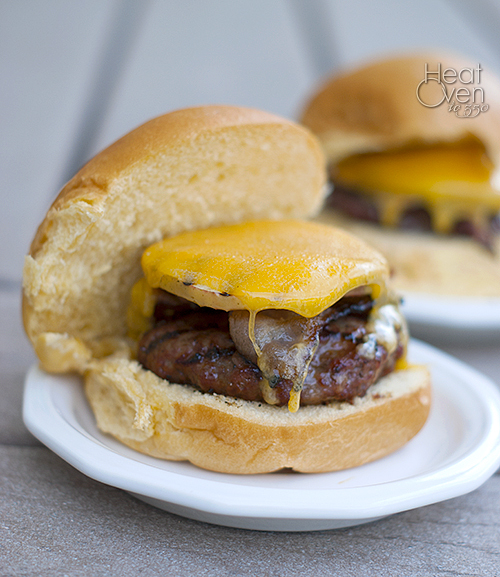 These burgers would be a great, easy way to try something a little different this summer. Using clean hands, mix together beef, 1/4 cup maple syrup and 3/4 teaspoon salt and black pepper to taste in a medium bowl. Divide mixture into four equal pieces and shape into patties. Set aside on a clean plate. Core the apple and slice thinly into rings. Brush each side with lemon juice to prevent browning. Cook the apple slices on the grill until they are just starting to get tender, about 1 minute on each side. Remove from grill and set aside. Add burger patties and cook about 4 minutes on each side, or until the meat is no longer pink inside. If you wish, baste the meat with additional maple syrup while cooking. When burgers are close to being cooked completely through, top with a slice of bacon, 1/4 of the apple slices, and a slice of cheddar cheese. Cover grill and let sit 1 minute or until cheese has melted. 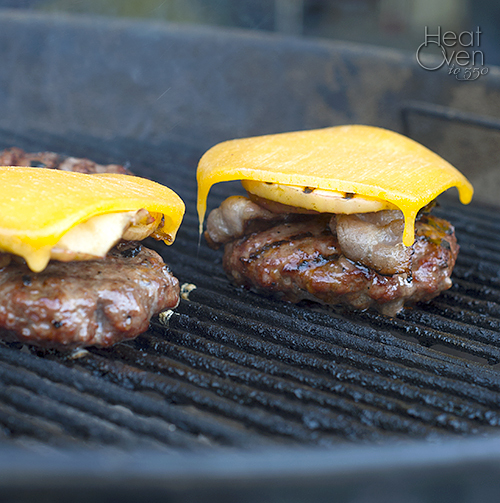 Once cheese has melted, serve burgers on hamburger buns. Oh, I soooooo nailed the maple ... and new it had to include cheddar. But I totally missed the apple! And, yes, McIntosh ROCK. We used to pick them all the time when I was a kid in Vermont. Love the burger, Nicole! Ha, I thought of you when I posted this. You are so good! Oh my! There's nothing like real maple syrup, and I've never thought to have it with a burger. These burgers look phenomenal! These look awesome. We just bought a grill, I'll have to watch for a sale on ground beef. Hi Leigh! Hope you enjoy them. Congrats on the new grill! Wow, that's quite a burger! I'd never have thought of that combo, but they make maple apple sausages, so why not burgers :) I didn't know you grew up in Vermont! That's one of my absolute favorite states, especially in the fall. Do you miss it? Now that's my idea of a burger!! I love the combo with the maple syrup, apple and cheddar. I'm so glad grilling season is here, adding these to our menu very soon! !